Nestled in the corner of a strip mall is a theatre that has consistently upped its offerings season after season. 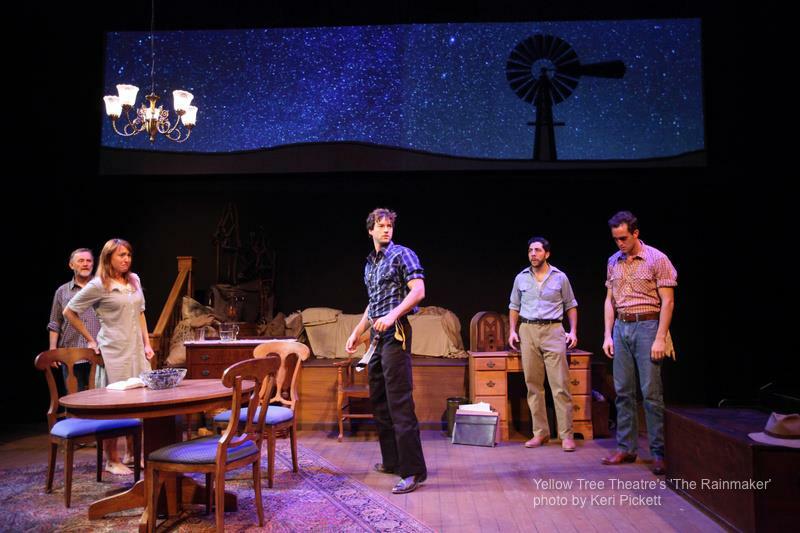 Yellow Tree Theatre in Osseo opens its seventh season with one of their best productions to date; N.Richard Nash’s The Rainmaker. Set in a rural drought-stricken town during the Depression era, we watch the events of a pivotal hot summer day play out in the life of the Curry family. Lizzie Curry (Dawn Brodey) keeps house on the family cattle ranch for her father H.C (Pat O’Brien) and two brothers Jim (Nathan Cousins) and Noah (James Rodriguez). As the devastating drought continues to take its toll on the cattle, Lizzie’s family is more concerned about her impending old maid status then the dying cattle. When a charming con-man named Starbuck (Peter Christian Hansen) arrives promising rain within 24 hours in exchange for $100, he sets off a series of events which enable Lizzie to see herself in a new light. Dawn Brodey captures the yearning Lizzie has for a husband and family of her own in a brilliant way. As she realizes her father and brothers may be correct in her permanent spinster status, you see all of her hopes and dreams come crashing down in her facial expressions. You can’t help but empathize with her. Peter Christian Hansen’s Starbuck, is very Matthew McConaughey-esque. His smooth talking con-man is larger-than-life. Pat O’Brien, better known as Mr. Dewey from NBC’s Saved By The Bell, gives an amazing performance as a father trying his best to protect his daughter and provide for his family. The Rainmaker, moves effortlessly from family drama to comedy with the help of deeply created characters and a cast of seven incredibly talented actors. The iconic themes of the search for love, struggles between dreams and the cold realities of the world and the tension between parents and adult children is prevalent. This play built on classic American values opens your eyes and your heart to see there is a bigger world of possibilities than what you think your future holds. The Rainmaker is playing at Yellow Tree Theatre in Osseo through October 12. More more info visit Yellow Tree Theatre’s website.